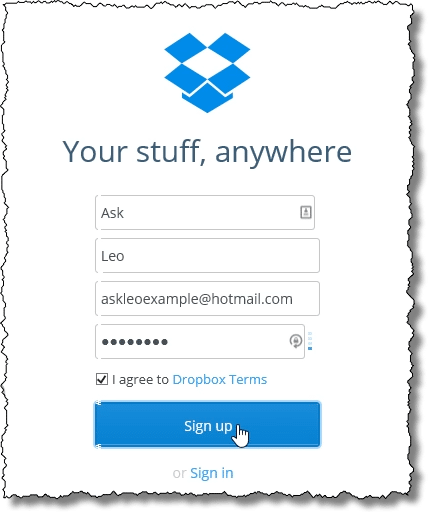 Using Dropbox for Nearly Continuous Document Backup - Ask Leo! One of the problems with daily backups is that they happen only once a day. Don’t get me wrong: backing up is a good thing, and doing those daily backups is incredibly important. But what happens when you work on a document all day long, only to have it disappear before that daily backup happens? That’s where tools like Dropbox come in. I’m going to use Dropbox as an example throughout this article, as it’s an ubiquitous and popular utility. If you prefer, however, there are alternatives, including SugarSync, Box.com, Spideroak, Google Drive, Microsoft OneDrive, and more. The key feature that these utilities provide is automatic syncing of documents between multiple computers. If you create or save a document on machine “A”, it is automatically replicated or updated on machine “B” (and “C” and “D” and however many you are using with the utility). Copy from machine “A” to the service’s cloud storage. Copy from the service’s cloud storage to machine “B”. Between those two steps, your material is backed up to the cloud. Even if there is no machine “B”, you still benefit, because every time you save a document, it’s automatically copied to or updated on the service’s cloud storage. What if there is no machine “B”? Then every time you save a document on machine “A”, it’s automatically copied or updated on the service’s cloud storage. That sounds exactly like a backup to me. Every time you save the document to disk – even one in the cloud – it’s backed up. Once you click Continue, the Dropbox downloader will download and install the program. It will automatically start with Windows. A Dropbox folder will be created in C:\Users\<username>\Dropbox, where “<username>” is replaced with your Windows username. The dropbox icon will appear in the taskbar notification area. The folder that the Dropbox installer created in C:\Users\<username>\Dropbox is where all the magic happens. Anything you place in this folder is automatically copied to the Dropbox servers. Anything you update in this folder is automatically updated on the Dropbox servers. This includes any and all sub-folders that you might create as well. And if you have more than one machine using Dropbox with this same account, then any files placed into this folder or updated on other machines are downloaded (synchronized) to this one. But this is only true for documents within the Dropbox folder. If you’re using Dropbox for automatic behind-the-scenes backup, we need to make one other change. Change the default document folder in whatever application(s) you use regularly to be a folder within the Dropbox folder. that document is automatically replicated to your Dropbox account online. 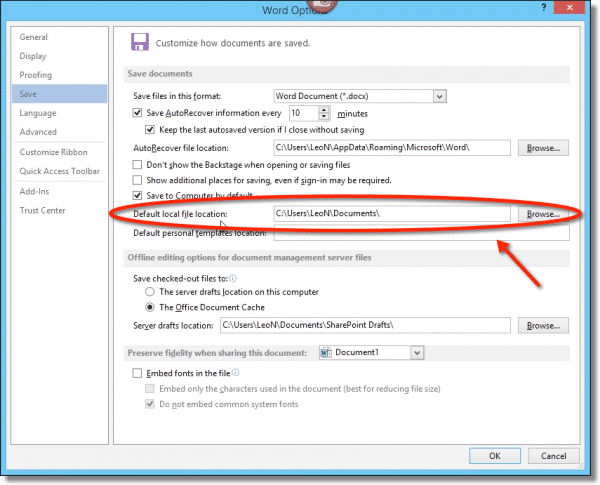 In fact, every time you hit “Save” in Word, the document is uploaded to Dropbox. You can always download the most recent copy from the Dropbox web interface. As I’ve said, the big selling point of Dropbox, and utilities like it, is that you can install it on multiple machines, and the files you place in your Dropbox folder will be synchronized across all of them. Dropbox online also includes version history. Quoting the Dropbox site: “By default, Dropbox saves all deleted and previous versions of your files for 30 days.” Thus, if you’re using Dropbox as I’ve outlined here, and you make a number of changes, or accidentally delete a file in the Dropbox folder on your hard drive, not to worry: you can still use the Dropbox online interface to retrieve previous copies of the file. Dropbox is available across different devices, including phones and tablets, as well as different operating systems, including both PC and Mac. My example has been about using Dropbox with Microsoft Word, assuming that’s where you do most of your work. In reality, any program that saves data to your computer can be set to default to your Dropbox folder. Dropbox, or tools like it, can be an important part of a healthy backup strategy. How Can I Back Up My Data More or Less Continuously? - With hardware failures, accidental deletions, and more, it's easy to lose files as you are working on them. What's the easiest way to back up your computer as you go? Dropbox: Share files Across Machines, with Friends, and Publicly, for Free - Dropbox is a utility that allows you to instantly share files between machines, and even with other users elsewhere on the internet. Up to 2GB is free. 1: I’m aware that on local networks this functionality is often optimized as a direct copy from machine “A” to machine “B”, in addition to the copy from “A” to the cloud. That, and many other optimizations, are beside the point of our current discussion. 2: There are ways you can increase the free plan storage to nearly 20 gigabytes – mostly using their referral program. 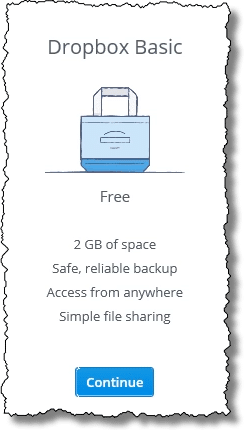 The amount of space included with the free plan is also one of the ways that competitors differentiate themselves from Dropbox. « Previous post: Where Do Downloads Go? Great article. For years, I’ve been using DropBox for my work in progress files and any files I wanted easy access to at work or traveling. Last weekend I turned My Documents into a OneDrive folder so now I have every user file on my computer backed up and synchronized. If one service is too small, using a combination of cloud backup services, you can back up all of your user files. Could you please explain how this would be done on a Mac (Yosemite)? Thank you. Here is the link to download DropBox for Mac. I don’t know much about Mac OS, so I don’t know about the directory structure and where the DropBox directory will install in a Mac, but I imagine it’s not all that much different than with Windows. Thank you. Appreciated. I and many others would love you to know more about Mac OS. In the future perhaps? It’s pretty close to exactly the same except that instead of C:\Users\\Dropbox the default location is in your home directory (/Users//Dropbox), and I think DropBox automatically adds itself to your favorites in Finder. For a very long time, many, many articles have been written on how bad Dropbox is for your privacy. Here is one of the articles from PCWorld. Which is why the article talks about “Dropbox or Dropbox-like services” and I also talk about BoxCryptor in other articles. I do believe most of the privacy scares are overblown, but there are many ways to address it. 27th Jan. Dropbox is a great idea, however downloader beware. Always go to http://dropbox.com, NEVER search via Google etc. A friend of mine did just that today and “sort of” got dropbox but she also got 4 unwanted programmes which Norton 360 took great exception to. A couple years ago I got on the beta test train for a product called ‘Bvckup’. It is a very simple and low overhead app that performs constant backups. After the Bvckup 1 beta test period ended, out came Bvckup 2. Which is now a commercial product that works flawlessly. You can establish multiple backup schemes that can run simultaneously. And, it’s only $19.95. Made by Pipemetrics. Great article Leo. I have Microsoft Word 10 and could not find the DEFAULT LOCAL FILE LOCATION. I only had DEFAULT FILE LOCATION. I tried altering this and when pressing SAVE, received the DOCUMENTS folder in DROPBOX. The only disadvantage is that if you accidentally delete the file from your dropbox folder, it instantly disappears from your computer and the “backup”. So not good! In that case, why not simultaneouly get the same file of foldr get synchronized in ‘Google drive’, ‘Box’ or ‘One Drive’??? I don’t believe that would be a solution. You could have a DropBox folder inside a OneDrive folder or vice versa, but deleting it from DropBox would also delete it in OneDrive. The good news, however, is that DropBox retains deleted files for 30 days. I believe these tools will conflict with each other if pointed at the same folder. Actually quite good, since as the article points out, Dropbox maintains file history – you can get it back. leo, I find that almost in all cases you recommend almost everything to be saved on system os drive, generally c: but I disagree about this location. in my 27 years of computer usage I always found it beneficial to restrict c: exclusivelt to o.s. and create from the beginning additional partitions like d, e etc and create the downloads folder on one of these partitions which ensures that all downloads are always in one drivw other than the system drive. of course just like system drive you must frequently backup. in the likely event os drive c becoming unaccessible due to any hardware problems. If there were any hardware problems, they would equally affect the accessibility of the other partitions. Partitions are essentially not much more than super folders which emulate drives; they all still reside on the same drive. That’s a good analogy. Naturally there are many differences in the details, but when it comes to organization of your data it’s a good way to look at it. But I have a question with respect to my PST files of Microsoft Outlook, which is my email client for a long time. Eversince Pendrives were made available I used to carry my PST files on it and copy it to any computer I may use when I go long distances. I was comfortable with this method. Please let me know if I can regularly and automatically get synchronized my PST folder which is about 1 GB, with all those folders and sub folders to either ‘Dropbox’, ‘One drive’ or ‘google drive’ ?. But I do not want to move my PST file from the present position. I have my PST folder situated on another drive on another Physical hard drive, so that in the case of a system failure and after reinstallation of the OS my PST files are still there. You could place the .pst file in a Dropbox folder, but perhaps the easiest way to synchronize the mail folders would be to synchronize them using IMAP which keeps the emails on the mail server and can then be synchronized on all of your devices. That’s what I do. I Have all of my emails synchronized on my 3 computers, 2 phones and a tablet. I also have access on any computer in the world through the GMail web interface. PSTs and Outlook can be twitchy – sensitive to unexpected things. It’s possible that it would work, but its also possible that this scenario would not. Personally, I might try it, but backing up at every possible opportunity until I was convinced that it was working properly. Oh, and if your PST is that large, realize that you may be transferring a LOT of data over your internet connection every time you change the PST. What if two persons on same Dropbox account try to work on same file at same time? Will Dropbox prevent this? Also, can I setup an ‘edit’ folder (one where files can be edited) on only computer A, and on all other computers B, C … files will be as ‘read-only’ ? Dropbox will not prevent it. It will notice a conflict if both people make changes, and will syncronize one as “X’s conflicted copy”. You’d have to manually resolve the differences. No, I don’t believe there’s a way to set up a shared folder as read only the way you describe. Dropbox will allow you to share folders with other users, either as full access or as read only access. Awesome. Thanks for the additional info. Great article and very informative. Now to go and re-tweak my Dropbox account. To me, SugarSync is much better for this reason: instead of having to go through gyrations to work within the Dropbox folder, you just specify to SugarSync which folders you’d like to have backed up to the cloud and/or synced to other computers–there’s no disruption to the organization of my system at all. To me that’s really a superior feature.